Prehistoric Paintings at Leang Timpuseng, Maros-Pangkep, Indonesia. hand painting in the world. or babirusa, at Leang Timpuseng Cave. oldest Asian art of the Paleolithic. Cave painting in the Maros-Pangkep caves near Maros, on the Indonesian island of Sulawesi, is among the oldest Stone Age art on the planet, according to a team of scientists led by Dr Anthony Dosseto of the University of Wollongong, Australia, as reported in Nature (Autumn 2014). according to a study in Nature (2014). The earliest art - discovered inside Leang Timpuseng cave - consists of a hand stencil dating to at least 37,900 BCE. This makes it the second oldest painting in the world. Only the El Castillo Cave paintings, which date to 39,000 BCE in Spain are older. Also at Leang Timpuseng cave is a painting of a "babirusa" (a type of SE Asian "pig-deer") dating to at least 33,400 BCE. All images were dated using Uranium/Thorium (U/Th) dating techniques applied to overlying coralloid speleothem calcite deposits. The discovery of the Sulawesi cave paintings proves that prehistoric art from the first phase of the Upper Paleolithic was being created at opposite sides of the world. This - together with recent discoveries of Paleolithic art at Blombos Cave and Diepkloof Shelter in South Africa - supports the argument that modern humans developed a common cultural and cognitive capability before leaving their home in Africa, rather than after their arrival in Europe or SE Asia. If this is true, we can look forward to more discoveries of rock art along the main stopping points of the route taken by these African migrants to their new destinations. To understand how Leang Timpuseng cave art fits into the evolution of Stone Age culture, see: Prehistoric Art Timeline (from 2.5 million BCE). The caves were first visited by the British explorer and naturalist Alfred Wallace in July 1857, during his trip to the East Indies. He later published the results of his trip in his book "The Malay Archipelago", although he made no mention of any cave paintings. In 1905-6, the Swiss naturalists Fritz and Paul Sarasin led a scientific expedition to Indonesia and returned with vivid accounts of ancient rock paintings, but offered few specifics. In fact there was no written account of Maros Pangkep cave art until 1950, when the Dutch archeologist H.R. van Heereken first reported the presence of hundreds of hand stencils and images of animals. Since then, Indonesian researchers have conducted a number of excavations in the caves, but few detailed reports have been published, not least because the art was assumed to be no more than 12,000 years old. Then in 1993, The XI International Speleology Congress recommended that Maros Pangkep be adopted by UNESCO as a World Heritage site. In 2009, the Indonesian government submitted Maros Pangkep for inclusion on the UNESCO tentative list of World Heritage Sites. Recently, an Australian-Indonesian team of archeologists and researchers - including Maxime Aubert and Adam Brumm, research fellows at Griffith University in Queensland - examined 12 images of human hands and two animal pictures in seven limestone caves at Maros Pangkep, and reported their results in Nature. In order to date the 14 paintings, the team used a "uranium decay technique". They collected 19 samples taken from thin layers of calcite (less than 10 millimetres or 0.4 inches thick) deposited on top of the painted surfaces over thousands of years, by mineral-rich water, dripping down the cave walls. The calcite contains traces of the chemical element uranium which decays into thorium at a specific rate. Thus, by analysing levels of the two elements in the calcite, Aubert and his colleagues were able to fix the minimum age of the painting which lay underneath. The results showed that most of the artwork is around 25,000 years old, which ranks it alongside the oldest scientifically dated works of art in Southeast Asia, notably the Nawarla Gabarnmang Charcoal Drawing (c.26,000 BCE), found at a cave in Arnhem Land, in Australia. However, the oldest art - a negative handprint, found on a 4-metre high ceiling in Leang Timpuseng Cave - was dated to at least 37,900 BCE, making it the oldest hand stencil in the world and the oldest piece of archeological evidence of a human presence on Sulawesi. In the same cave, researchers found a picture of a female pig-deer (babirusa) dating to at least 33,400 BCE, which ranks it alongside the world's oldest figurative art - the Fumane Cave paintings, found near Verona in Italy - which date to 35,000 BCE. The next oldest figurative art from Europe is an image of a rhinoceros among the Chauvet Cave paintings from the Ardeche Gorge in France, dated to approximately 30,000 BCE, although some (non-French) archeologists continue to question this estimate. 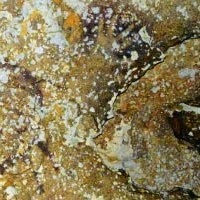 As in the oldest sites of Franco-Cantabrian cave art - including Altamira Cave, El Castillo, Cosquer Cave and Pech Merle Cave - as well as the Karawari rock shelters of Papua New Guinea, and the Kalimantan Caves in Borneo, the Sulawesi caves contain both handprints and animal paintings. As to the prehistoric animals depicted, the vast majority are large, sometimes fearsome, mammal species that no doubt loomed large in the lives and belief systems of the cave painters involved. Most of the creatures in the murals are identifiable, although certain physiological features are exaggerated in some pictures, perhaps for spiritual, shamanistic or aesthetic reasons. The most commonly painted animals at Maros Pangkep are pig-deer known as babirusas, Indonesian warty pigs and small buffalos known as anoas. 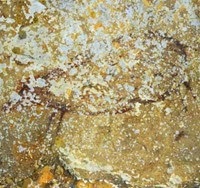 The oldest cave art in the Maros Pangkep caves tends to be handprints and other abstract signs, followed by the animal pictures, the latest of which is dated to 15,400 BCE. In other words, Sulawesi's art was created during all four of the main European cultures of the Upper Paleolithic: the Aurignacian (40,000-25,000 BCE), the Gravettian (25,000-20,000), the Solutrean (20,000-15,000) and the Magdalenian (c.15,000-10,000). The uranium/thorium dates obtained for the hand stencil (37,900 BCE) and pig-deer painting (33,400 BCE) at Leang Timpuseng Cave are minimum dates, but nevertheless they establish the following. The island of Sulawesi is now home to the oldest prehistoric art in SE Asia; its caves contain the oldest hand stencil ever found and the second oldest figurative painting ever found. Up until recently, it was believed that "modern humans" - who began migrating from Africa across the globe, about 80,000 BCE - lacked the cultural and cognitive capacity to create parietal or mobiliary art of any significance. It was only much later (from about 15,000 BCE) that they developed any real artistic ability. Except for moderns who migrated to Europe. Unlike most other migrants, those arriving in Europe (from about 40,000 BCE) met and clashed with the indigenous species of Neanderthal man. This clash, it was believed, precipitated a major "cultural and cognitive advance" which enabled the European moderns to create art. Alas, this argument has become weaker and weaker, as it became obvious that these moderns were creating art from the moment of their arrival - that is, well before such a "cultural and cognitive advance" could have occurred. So where had the artists at Altamira, El Castillo, Hohlenstein and Chauvet cave acquired the mental capacity needed to create their pictographs and venus figurines? The answer, most archeologists began to suspect, was - in Africa. Except there was very little evidence. Hardly any prehistoric art had been found in East Asia, SE Asia, Australia or the Americas, that was contemporaneous with that of Europe, and most known works were much younger. 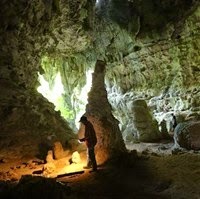 But the discoveries in the caves of Sulawesi have changed everything. Because we now know that very similar parietal art was being created at opposite ends of the world. Which is either an incredible coincidence, or else it shows that modern man shared a common creative ability - which, if true, means that he must have developed this ability BEFORE leaving Africa. This possibility is supported by recent discoveries of the Blombos Cave Engravings, not far from Cape Town, and the Diepkloof Eggshell Engravings in Western Cape, in South Africa. We should certainly expect new discoveries of Aboriginal rock art in Australia. After all, if prehistoric artists were creating cave art at Sulawesi - less than 500 miles away from Australia's northern coastline - in 37,900 BCE, they must have reached Australia within a relatively short time thereafter. Yet despite the profusion of prehistoric petroglyphs among the Burrup Peninsula Rock Art from the Pilbara, the Kimberley rock art from the northern fringe of Western Australia, and the Ubirr rock art from Kakadu National Park, Arnhem Land, the oldest artwork in Australia is carbon-dated to as late as 26,000 BCE.  For more about the world's most ancient art, see: Cupules.  For the oldest pottery in Asia, see: Xianrendong Cave Pottery (18,000 BCE).  For more about art in Asia, see: Chinese Art Timeline (from 18,000 BCE).  For more about art in India, see: Bhimbetka Petroglyphs (c.290,000 BCE).  For more information about Indonesian prehistoric art, see: Homepage.